Are we being scammed on our displays? This morning, I arrived at my trusty desktop computer in my home office, only to discover that my 24-inch monitor is going bad. (I have a 24” and a 22” sitting next to each other.) I’ve got a bunch of vertical lines of different colors running through my desktop, and I’m sure it’s only a matter of time until it fails on me. I’ve had this monitor for over 5 years though, so I suppose it’s gotten a good amount of use. So I headed over to Dell’s website this morning to see what the prices on monitors had dropped to. 5 years ago, the concept of a 30-inch monitor was almost unheard of, or you had tons of money to throw at one. I was sure that the price had come down a bit by now. I was sorely disappointed. $1299 ON SALE for a 30” monitor. Crap! Over the years, I have hooked up my laptops to many different televisions in my home, and it’s been a pretty enjoyable experience, I know that a 30” HDTV CAN’T be more than a few hundred dollars. I got quite a few responses, and they all had a pretty common theme: refresh rates, max resolution, and contrast. So, I decided to do a little research, and below are my results. 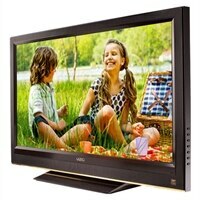 I am comparing a 32” Vizio 1080p HDTV with Dell’s top-of-the-line 30” UltraSharp monitor. My question for you, dear reader, is why would I get the monitor over the television? Resolution I am currently running my 24” monitor at 1920 x 1080, and I can’t imagine those icons getting any smaller. Is 2560 x 1600 a useful resolution for a work machine? Seems like overkill, especially when I get to the price. Color Depth Once we’re in the millions, what’s the difference between 16.7 million and 1.06 billion colors? Remember, I play almost no games on this machine. It’s for work. Dynamic Contrast Ratio I’m not sure if I’d notice the difference between those two values in Visual Studio, Powerpoint, or TweetDeck. Maybe if I turned all the shading on in World of Warcraft, but I doubt it. Mind you, my current 24” monitor has a 3000:1 ratio, so I’m betting either will seem like an improvement. Pixel Pitch This one’s actually got me a little concerned. Does .1 millimeter between pixels matter? I sincerely don’t know, but for a $900 savings, I’m probably willing to find out. Display Ports I am currently running one video card that supports VGA, DVI and HDMI outputs. It can handle any two of them at a time. I am only using the VGA and DVI outputs right now. I would expect to use the HDMI with either of these displays. I’d love to hear from everyone that knows more about this stuff than me (which is pretty much everyone but my mom, I’d bet.) What am I missing? Really like this topic and am very curious to see if your readers have any real experience with using tv for a business/development monitor. “Dynamic contrast ratio” is more or less a made up number, according to CNET. That’s why you almost never see the “static” contrast ratio published anymore. 1920 x 1080 at 32″ might not be terrible for video or games, but will be pretty noticeably bad for productivity work. Compared to the Dell, it would be sort of like running your current 24″ at 800 x 600 instead of 1920 x 1080. Things *would* look bigger, but you’d lose a lot of precision and image sharpness. That extra resolution and color is _very_ expensive from a manufacturing perspective (pixel pitch plays into this as well). Also, since there’s only two that I can find at that size, I’m guessing that’s another reason why it’s at the given price point. Looking at 27″ monitors with specs like you outlined, it’s less than that TV (at the same resolution, $250-300 on newegg) and there’s also a LOT of them at that size. Simple supply/demand. You will definitely notice a difference. As you found in your research, computer monitors have a much higher pixel density than televisions. This is because we sit much closer to monitors than televisions. I suspect you will find that the resolution you use on your 24″ monitor is painfully grainy on a television. If you do a lot of reading on your screen (and since it’s “for work”, you probably do), you might miss the pixel density of monitors. Try it out, let us know. It’s only $330 and you can still use it as a TV if it doesn’t work. We use several HDTV’s at home for monitors. The only drawback is that if you put two side by side there is a much bigger gap between the two screens – but different brands may have narrower frames. We bought the 1st TV one so we could use it either as a monitor or a TV mounted in front of the treadmill. I’ve used a 40 LCD as monitor before, when you work for some time on it you can tell the difference in your eyes, (I felt them tired after a couple of hours vs 8 hours on a monitor). It was an old 40 LCD tv, but in any case working with my 2 22″ and 24″ inch monitors have been better. Might be better off getting 2 or 3 22″ or 24″ monitors for the same price…and similar resolution. Personally I like blindingly high resolution. My 15.4″ laptop screen is 1920×1200 and I lament the fact that I can not get that in any new laptop…or not many at least. I want my 180 extra pixels! But I have to agree, it is about time large screen monitors come down in price. Look how much they came down for the 22″ and 24″ monitors. One thing with a 30″ though…You probably only need 1. I’ve been watching the monitor resolution vs size issues over the past couple of years. I currently use multi monitors on my desktop. The monitors that match 1080p resolution of any size are often available for close to $120. If you want significantly higher resolution you suddenly pay $850. I would really like higher resolution, but I can’t justify it vs simply getting multiple monitors. Because I like the high resolution, I’m actually happier with the smaller montiors than increasing the size. It’s not how small the icons may be, but how crisp and readable the text is at smaller sizes, and how much information you can present at the same time. If you’re happy with 1080p, get another 24″ monitor. It’ll run you <$200. For your stated purpose, the 30″ isn’t for you. They are useful for high end graphics and possibly scientific imaging applications. You don’t need the resolution or the higher bit depth, so spending for those features holds no value to you. For the person who does need those features, they do. It is still probably overpriced, but then the premium model of anything is typically disprportionately expensive, relative to the added value of its features and extras. Also, before you ditch the “bad” monitor, check your cables. Could be a $5 fix to replace a bad cable. If you look at the relative pricing of monitors instead of “tv vs monitor” you’ll see the same difference – ANY size up to 1920×1200 will be less than $400, while ANY size with resolution greater than 1920×1200 will be more than $800. You can get a low-res 27″ monitor for $250 or a high-res 21″ monitor for $3000. You are comparing Apples and Oranges. That is a high end IPS screen designed primarily for graphics work compared to a poor quality TN film screen designed for watching poor quality movies on. Viewing angles on a IPS screen will actually be 178 degrees, on the TN TV it will be closer to 30 degrees of color accurate viewing and the rest will be varying shades of not right. Millions vs Billions of colors is really due to that monitor being designed for graphics professionals. Each shade of a color cannot be properly represented on a conventional sub $300 monitor due to cost cutting causing the colors to be rounded off (most are 6 bits per pixel instead of a proper 8 or more). If all you do is programming and such on 1 monitor you won’t notice the difference, if you do graphics work you would notice a huge difference. IPS monitors are also designed for proper color reproduction at an angle, this means that if you look at something and then move your head around 40-50 degrees you will still see the exact same shades of color, on a poor quality monitor or TV the color will change. Again important for graphics, but also can be important when using multiple monitors as you don’t get disorienting color shifts as you change from monitor to monitor during use (gets even more important the larger your screens are). Also quality, a top quality monitor like the Dell Ultrasharp is designed to last. It isn’t meant to be replaced every 3-5 years. Most are designed for 7-15 years. I personally use 2 10+ year old LG IPS 19″ monitors for programming. They are still both in 100% working condition and I seriously doubt I’d need to consider replacing them for at least 5-10 more years (except for wanting 30″ monitors myself). If you are looking for a large monitor for a deal get a 27 or 28″ one as they make those with low quality parts like TN film and off brand names (Check tigerdirect.com, or newegg.com). Or wait for a Dell deal of the day on the 30″ and get that for $800-900 instead. Don’t get a TV as they are designed for sitting at 4+ feet not 12-18 inches. And to those about resolution matters, it does. In this case the price difference isn’t resolution, a 30″ TN film monitor at the same res as the Dell would be around $500. Its the fact that the LCD panel in the Dell is a top end (and very expensive to manufacture) IPS panel. Everyone should read Cam’s description closely. First reasoned response here. I’ve been happily using the 24″ version in the Dell Ultrasharp range (the U2410) and figure it’s a bargain. Put two of them side-by-side for less than the cost of one 30″! For me an IPS panel is a must and they’re unfortunately rare, hard to find, and under-marketed. If only the panel-type was an advertised feature! When you look at a screen all day the TN panels are crap and I’d rather look at a CRT! I got a pretty big 1080p monitor by accident a few months ago (meant to use it as a TV monitor for my dish box but it has no remote and it couldn’t be returned) and it’s fine for day to day programming work. On the other hand for astronomical photo processing I could definitely use that extra color space (Adobe RGB rather than sRGB probably) and resolution as my images start around 3000×2000 and mosaics are even bigger. With a fine pitch monitor you can increase font size and they will be rendered smoother than they would on a coarser monitor of the same size. I think you’ve summarized the differences well and that should enable you (anyone) to decide if that monitor is right for them and their tasks. Of course some people buy it for gots-ta-havvitz but that’s an emotional decision, not a logical one. Looking at my 42″ Vizio with LED back lighting I can tell you the image quality is decent but not terrific. Small differences in brightness aren’t a huge deal when you watch a movie but when looking at static images such as when you’re editing text it becomes bothersome. I’d get a smaller 1080p monitor in that case. TVs and monitors are optimized for different things. This has been a long-standing question for me, too. One one hand, it’s the resolution, or, more precisely, the pixel pitch, that matters; On the other hand, it may be the disproportion of price vs performance with high-end products like the 30″ Dell monitor that makes the big difference of prices. I ran two brand new (high end) 32″ LCD TVs for monitors about 6 months ago. Seemed like a great idea, lots of real estate for VS 2010 and way cheaper. It lasted a whole 2 weeks, I couldn’t stand the headaches I was getting. Compared to the 27″ monitors I have now; the TVs were grainy and the colors seemed… odd no matter how I adjusted the settings. At a distance TVs are great, but that close, you’re asking for a massive headache. I would never try it again. It seemed like a great idea, but turned out to be an epic fail. I ended up getting a pair of 27″ monitors for around $700. I returned the TVs; which were roughly the same price as the monitors. Bigger is not always better. 27″ monitors ended up having more real estate then I actually needed. I would suggest a pair of 24″ monitors. Steer clear of TVs! You’ve posed an excellent question and articulated it really well. Here’s my 4 cents: I looked at 30-44″ 1080p displays, that cost less than $600. And they were plenty bright. Instead, there are 2 of those 30-inch displays on my desk, side-by-side, displaying their 2560-by-1600 resolution (each), and I paid over a thousand for each of them. I chose the display-card carefully, to ensure it can drive both at full rez. Why? Because when I’m designing software, I want to see all that code. The GUI, the artwork, the notes, and the hundreds of lines of bug-filled C#. Oh – and I like to open browser windows to look up how to program this stuff. There is absolutely no way I could get by with only 1920-by-1080 pixels. But if I want to show a HD movie to the kids, that 1080p TV-style display is the best solution. And I’m very grateful that these 30-inchers are avail now for only $1300, instead of the $2K they used to cost. For serious tools, for professional use — these are a bargain. I have been using 40 x 32″ TV’s as monitors on a production line for the last 6 months, running 2 and 3 shifts no problems so far but they are viewed from between 1.5 and 4 metres away. Cost of using true monitors to do this would be prohibitive. Going above 1920x1200px is a huge step. Remember that HDMI maxes out at 1920. Going to 2560 requires double link DVI (or newer HDMI which is not wildly supported). So this strains electronics, overall design etc. This is bandwidth issue, remember that most of 30″ 2560x1600px displays doesn’t have OSD because of that. And believe me sitting 30cm from 30″ display is great, but I can’t imagine it for a 30″ LCD TV. i) When designing software/websites for a 32″ Screen, think about the space between your eyes. ii) Contrast / Brightness on a HDTV is far too bright for normal use. I set mine to 40% original setting, and it seems much less headache worthy. Often, I find myself setting my fonts much larger than usual, in the terminal/VI. (A GNU Text Editor). This is because so much more can fit onto the screen. Final point to make, I often ‘see’ the pixel spacing! But only on dark backgrounds and to be honest, I think that it looks cool. Resolution is only needed for large screens else the eye will not see these tiny pixels – more manufacturing hype to buy the latest ……. Think about this in terms of a monitor’s ability to display different brightnesses of a particular color, or grey. With a 24-bit display device (8 bits per color channel), a monitor can only display 256 shades of grey, which is fine if you’re displaying a gradient from white to black over a smallish area, but if you’re trying to display a gradient from 80% brightness to 100% white, then the banding that results is very visible. Having the “extra” colors available makes shading MUCH nicer. Also, the higher the resolution, the easier it is on the eyes. The latest iPod’s “Retina” display has over 300 pixels per inch, which is unheard-of (or incredibly rare, anyway) in a monitor. But in print, we’re accustomed to over 2500 dots per inch for professional printing, and at least 600 dots per inch in desktop printers. We take a lot of cues from subtle differences of line thickness in well-designed fonts. I guess the summary is: I really disagree with your assertion, R Whitrow. I think the higher price has more to do with the number of devices that are sold. Consumer market is much bigger and you have more manufacturers to compete. What do you think, how many are requesting desktop monitors larger than 24″? And how many want to have a big tv? A second aspect is that some people search for exclusive hardware no one else has (or want to have), and those people accept overpriced devices, no matter how hight it might be. 2560 x 1600 on 30in is probably about the same pixel pitch as 1920 x 1200 on 24in. I haven’t done the math, but I’m confident. They don’t just pick those figures out of thin air! There’s also another issue – modern TV monitors have an aspect ratio of 16:9. Modern computer monitors are increasingly using TV panels, because of the huge economies of scale achieved by using the same basic parts. I often attend LAN parties where several members bring their HDTVs instead of monitors. They bring those because they are bigger, cheaper if they get damaged in transit and they won’t be word processing (hopefully). From personal experience for general computing I will always go with a monitor. TVs are designed to look good from a distance. You can’t tell resolution or pixel pitch from a difference. But up close, your eyes will strain, go ahead and google eye strain from pixel pitch, a little is a lot. They are designed for images. Monitors are designed for close viewing for extended periods of time. I don’t find contrast ratios to be an issue. For your use, if you work 8+ hours a day in front of it reading text opposed to watching pictures, get the monitor. Your current monitor is 90DPI vs 100 for the 30″, it’s not that much of a difference. I have a 30″ and find it really useful in outlook because I can have my list of messages and preview panes side by side without crowding anything. For browsing the larger tab strip is great if you have lots of pages open at once; although fixed width layouts limit its utility in reading pages. Visual studio also seems great with the extra space for all the stuff that would otherwise be squished or on autohide (shudder); but since the 30’s my personal monitor and 99% of my coding is on my work machine my observations there are rather limited, beyond more lines of code displayed at once is always a win. In Word it makes 2 pages side by side much easier to read if smaller fonts are used. Um the issue is your on the wrong website, your forgetting Dell slaps about 1k onto anything they do. This includes monitors, sorry but your just not shopping around. I just got an acer 32 inch touch screen monitor for 400 bucks. Overall the TV vs Monitor is really all the same technology, its just a matter of a stand mount option or not. Sorry but the thing is to realize Dell is the problem not the TV vs Monitor debate. Risking sounding condescending which I assure you is not my intention, I would say that if you don’t know why you should get the 30″ Dell or any other similar monitor you probably don’t need it. There’s some truth to that sort of affirmation. For example, why would you buy an LCD with an IPS or PVA panel vs. a TN panel? Then you have to understand and see for yourself the difference between 16:9 and 16:10. Which one do you need? Buy them both, install them in your environment and use them for what you usually do and see which one is better (for you). I hook my laptop up to my HDTV and it is very grainy. It looks good when watching movies over NetFlix, but the Win7 desktop and apps look like I’m using a 525 line analog TV. The image is a bit grainy when sitting this close, but entirely usable. What I like is that having this one monitor is as good as having two smaller monitors. My productivity is much better this way. As far as colours and such, I have not noticed any issues. The other nice thing: My office is also something of a den, and the Sony can serve dual-purpose that way. I already have a 40″ connected to my tower using HDMI. From a distance, everything is good, but it drives me nuts to be too close. As many others have said: at that price, get two. At least if the TV craps out after 5 yrs, you haven’t spent as much on a dud. You sure its the monitor? Video cards have a much higher failure rate. A lot of them have fans that stop working and then they overheat. The overheating can cause the vertical lines in the display. The answer is obvious. The 30 inch Dell is a very specific monitor used for very specific applications. It has unusual color depth and pixels. It would make no sense for you to buy it. It is great that Dell is making something for such a small segment of the market. You should get a new 24 inch monitor which has come down in price – you can get the LED now – for $180 on Amazon. My concern has always been – can I use a computer monitor as an HDTV? Why do I need to pay for a tuner if I have a cable box? There’s also the “in-between”, go to newegg and look for the Hanns-G 27.5″ monitor (model# HZ281HPB NE Item# N82E16824254052). It’s 1920×1200 native and sells for $290. I’ve got one and it’s quite nice, especially for the price. I think the 1080p TV’s are cheap because they make a zillion of them, I suppose at somepoint 4Kx2x TV’s will become cheap (as well as make nice monitors :-). Hi-Rez monitors probably don’t cost that much more to make but minimal competition means that higher retail prices can be demanded. This year I acquired a HP 30″ monitor to replace a 24″ and I don’t think I’d go back. Yes, it is much more expensive. But it has twice the pixel count of HDTV resolution. The extra vertical space is wonderful. The colors are perfect and there’s never any color bending when I slouch in my chair. This particular model also has one of the lowest display latencies available which is great for games. This is because it doesn’t have extra hardware between the digital input and the display. There’s no resolution scaling and there’s no on screen display and there is definitely none of that accursed resharp, motion blur, vibrant color processing crap that ruins the picture. The value added component complexing the amalgamated dichotomy diffusing differential quality is paramount to consider. Especially when you buy creamy vs. chunky peanut butter. Pixel density should be of one of the more important considerations. As well, the smaller 24″ inch will go better on your eyes for extended periods vs. the light output from the 30″. As far as resolution and ‘wanting more space”, consider using the built-in virtual desktops in Windows 7 (Desktop Manager..?) & and Mac OS X (“Spaces”). For WinXP use VirtuaWin (free, downloads.com). There is another thing you are missing. If you are using a HD6850+ (those are the ones I’ve tested), you get the pain of the graphics card trying to underscan by default. I’ve had instances where when connecting to a screen that the card can see is a TV that even with selecting all the overrides it won’t stop overscanning when you switch resolutions or reboot without doing uninstall and reinstall of the drivers are running a driver cleaner. I personally use a 26″ Vizio TV for playing games on my gaming windows computer. Works well enough, though the game doesn’t support the resolution natively. What about another option – you can get 18 ” monitors for $70 each at Staples. What if you got an array of 4 of them for $280. They have a resolution of maybe 1400×900 so the total resolution would be 2800×1800. Wow. Good timing for this question. I personally was thinking if I could use my LG 42 inches tv as a monitor to replace my 24″ dell since I was thinking about a LG 3D tv and did not know what to do with the current 42″ LG. I connected the laptop to the tv HDMI and noted the differences. Screen running at 1920×1080 resolution and sitting almost as close as the way I sit at my monitor. 1. General picture quality and sharpness is incomparable. The monitor wins hands down. This is valid for even the simplest drawing such as the start button circle. I was able to improve the image by setting the tv to game mode and it came fairly close. I think this is because of the pixel pitch difference. 2. I tried starting Visual Studio and looking at text. Fonts are less clear and the colour shades are a bit “off”. Also the screen is very bright compared to the monitor and this could hurt your eyes every quickly. Did not try brightness adjustments though. 3. Sitting at a distance from the tv like you do on a workstation may not be possible and as you move more than 4 feet away, it is hard to see the text clearly. 4. Playing a movie showed very little difference and this is where the tv wins. 5. for larger screens the higher resolutions will make a difference and look better, so 2560 x 1600 on a 30″ is definately going to make a difference and look better that 1920×1080 on a 24″. I should have tried a game though. Anyone have anything to add to this. Cam’s comments are pretty accurate. It’s about the megapixels. The 30″ has 4 megapixels. The 24″ or the HDTV only have 2 megapixels. On screens, megapixels are what matter, because they determine how much content you can fit on the screen. A 55″ HDTV is going to look awful if it’s displaying a spreadsheet or something because everything will be huge and blocky. At the same time, camera sensors ought to be measured by size, not megapixels, because the size determines how much light they can capture and how clear the image will be. Sadly, manufacturers try to sell screens on size and cameras on megapixels, because it’s cheaper to make large, low-res screens and small, dense camera sensors. Lately, we’ve seen micro-four-thirds sensors come out, which are larger, better camera sensors. Computer screens haven’t emphasized resolution much yet, though, because it’s easier to brag about a large screen then a high-res screen. The answer has nothing to do with the features of the 2 “monitors”. They have essentially the same electronics. It has to do with supply and demand. There is more demand for the larger tv/monitor and so most manufacturers have built their lines to produce this size. It creates an economy of scale for that size tv/monitor. Because all of the parts to produce this size are made and purchased in large quantities, it drives the cost to make the device down, as well as the purchase price to the consumer. You see this type of pricing in the memory chip market all of the time.